THIS EVENT IS CANCELLED DUE TO FIRES/SMOKE IN THE AREA!! The founders of the Carver’s Cut airstrip and the CA RAF Liaisons are having a Fall Flapjack Fly-In at our brand new private airstrip in the southern High Sierras on Saturday, Oct 7 - Sunday, Oct 8th. The strip is on a private ranch holding completely surrounded by National Forest, gorgeous granite peaks, a stream with natural rock water slides and swimming, fishing, and hiking. If you would like to join us, you can stay for the day or stay for the weekend and enjoy a hearty Sierra Nevada flapjacks breakfast, good company, and beautiful mountain scenery. ALL ATTENDEES MUST COMPLETE THE "PERMISSION TO LAND REQUEST FORM" (blue box on the right side of this page). THE AIRSTRIP: Located a 10min flight north of Kern Valley Airport (L05), the 4500’ MSL dirt airstrip is 1400' x 50' with an approx. 4% slope downhill towards the south. There is a short windsock at the southwest end of the airstrip. If you need to land at Kern Valley Airport (L05) and get shuttled up, please call ahead of time to make arrangements with our Kernville Uber/Lyft driver Jim Warner 760-223-3635. The price is usually about $35/car ride. THE AMMENITIES AND ACCOMODATIONS: Carver’s Cut airstrip has a cabin, toilet, shower, kitchen, BBQ, covered kitchen and eating patio, tent platforms and plenty of open space to camp. There's a shooting range area near the cabin, a swimming hole, the famous Tea Cups Waterfalls, hiking, fishing in the creek, and natural rock waterslides. THE PLAN/CAMPING: We'll be hanging out and cooking a hearty flapjack breakfast and sides on Saturday, Oct 7th from 8:30am-10:30am. Feel free to camp out Friday and/or Saturday night. Carver's Cut approach and departure video. 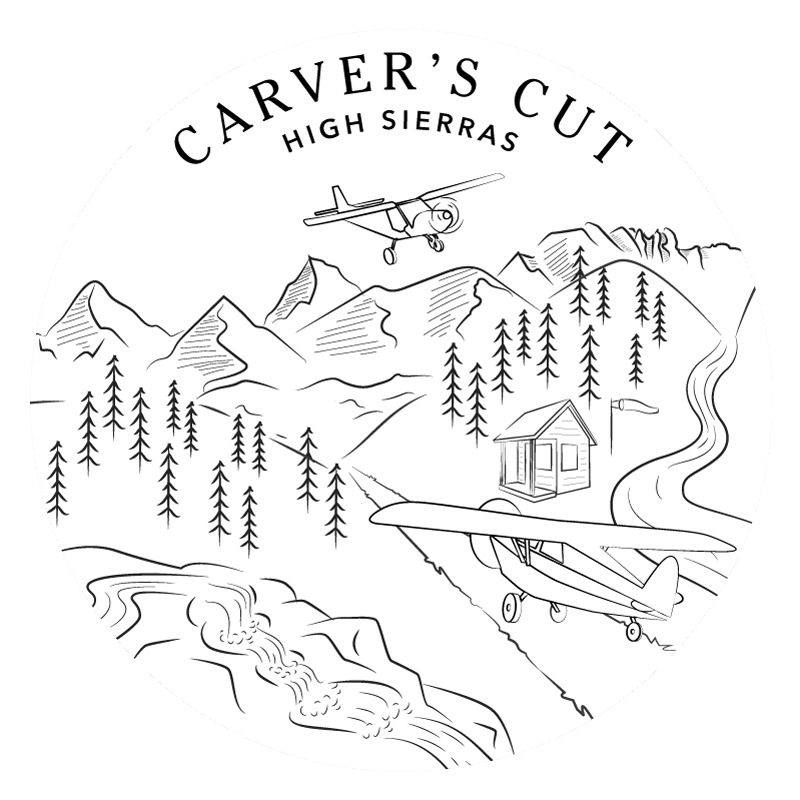 Carver's Cut is a private airstrip for use by permission and accompaniment of the founding pilots only. YOU MUST READ AND SUBMIT THE CONSENT FORM TO REQUEST PERMISSION TO LAND/ATTEND THE AIRSTRIP/EVENT. ​By clicking submit, I am requesting permission to land and intend to operate my aircraft for the purposes of safe takeoff and landing at the Carver's Cut Airstrip. I agree and understand that doing so is solely at my own risk and expense. I further understand and agree that the backcountry airstrips are not improved airstrips and that any operations from those airstrips are considered unimproved landings/take-off areas. I further agree and understand that I am responsible for evaluating the landing/take-off area and making the determination for myself as to the safety of using the unimproved field for such a purpose. I also agree that neither Carver's Cut Airstrip nor any of its founders, landowners, managers, or land lessees have made any representations as to the safety of using the unimproved backcountry airstrip for operating my aircraft, and my use of the airstrip is being undertaken at my own risk. I alone am responsible for determining whether my aircraft is suitable for operating in and out of these unimproved airstrips. I further agree and understand that fly-in hosts or airstrip owners may place cones or other boundary or signaling devices at the respective airstrips and that any reliance upon the same for safety is taken at my own risk, and that neither the fly-in hosts or airstrip owners is responsible for the same.